This name uses Portuguese naming customs. The first or maternal family name is da Costa Vieira and the second or paternal family name is Lopes. Leila Luliana da Costa Vieira Lopes Umenyiora (born 26 February 1986) is an Angolan actress, TV host, model and beauty queen who won the titles of Miss Angola UK 2010, Miss Angola 2010 and Miss Universe 2011. Lopes was born on 26 February 1986 is Benguela, Angola. Prior to being a contestant in beauty pageants, she studied business management at the University of Suffolk in Ipswich, UK. Lopes is actively involved in raising awareness about HIV/AIDS and the discrimination that people with the disease experience. While living and studying in England, she participated in Miss Angola UK on 8 October 2010. Lopes won the title, giving her the opportunity to represent the British Angolan community in Miss Angola 2010. Lopes beat 20 other candidates to be named Miss Angola in Luanda on 18 December 2010, gaining her the right to represent Angola in Miss Universe 2011. She also obtained the Photogenic Award during the contest. On 12 September 2011, Lopes was crowned Miss Universe in São Paulo, Brazil, receiving the title from the former Miss Universe Ximena Navarrete of Mexico. She is currently the 60th Miss Universe titleholder, and is the first Angolan woman to hold the position. Lopes is the 5th woman of African descent to win the title since the beginning of the worldwide pageant (following Miss Trinidad and Tobago in 1977, Miss USA in 1995, Miss Trinidad and Tobago in 1998, and Miss Botswana in 1999) and the fourth African woman from the African continent to win following Mpule Kwelagobe, Miss Universe 1999 from Botswana. In October 2011, Lopes paid a visit to Indonesia where she attended local charity events and Puteri Indonesia 2011 Pageant held at Jakarta Convention Center, in Jakarta. In December 2011, Lopes was invited to attend the first edition of the Miss Gabon Pageant in Libreville, Gabon where she crowned the first Gabonese representative to Miss Universe, Marie-Noëlle Ada Meyo from Ngounié Province. In February 2012, Lopes visited Johannesburg, South Africa. On arrival she was welcomed by Miss South Africa 2011 Melinda Bam at a red carpet event in Sun City. During her visit, Lopes attended a launch event for African Fashion International on February 16 in support of Joburg Fashion Week 2012. She also visited one of Melinda Bam's supported charities - Thuthuzela, an NGO which looks after abandoned and orphaned children in Alexandra Township. Lopes also attended the State of the Province Address by Honourable Thandi Modise, Premier of the North-West, on 17 February at the North-West University, Mafikeng Campus. Lopes travelled to Düsseldorf, Germany with her fellow titleholders Alyssa Campanella and Danielle Doty for a week-long USO/Armed Forces Entertainment tour from 9–14 March 2012. During the week, she also participated in the Beauty International Trade Show which took place at Düsseldorf Exhibition Centre. Lopes walked the red carpet at the Cannes Film Festival in Cannes, France on 23 May 2012. She also attended the De Grisogono Glam Extravaganza held at the Hotel Du Cap Eden-Roc in Cap D'Antibes, France on the same day. Prior to her visit to France, she was in Lisbon, Portugal for a series of photoshoots and television appearances, at the invitation of Maxim Portugal Magazine. In June 2012, Lopes embarked on a 5-country West African tour to Senegal, Côte d'Ivoire, Ghana, Togo and Nigeria. Later that month, Lopes attended the Rio+20 United Nations Conference on Sustainable Development in Rio de Janeiro, Brazil. In October 2012, Lopes visited Nicaragua for 'Fashion for Smiles', a fashion show organized by Operation Smile Nicaragua with Silhuetas models, which took place at the Crowne Plaza Convention Center in Managua with the participation of 15 Miss Universe 2012 competitors from the Americas. During her reign, Lopes visited Singapore, Indonesia, Angola, Cambodia, the Bahamas, Gabon, Jamaica, South Africa, Germany, Dominican Republic, Portugal, France, Senegal, Côte d'Ivoire, Ghana, Togo, Nigeria, Brazil, Guyana, Nicaragua, Namibia, Kenya, Mozambique, Russia and the USA. After Lopes was crowned Miss Universe 2011, allegations arose that false documents were used to allow her to participate in Miss Angola UK, which enabled her to compete in Miss Angola and subsequently Miss Universe. It was claimed that Lopes had never lived outside of Angola at the time she competed, so should not have been allowed to enter a competition that was exclusively for Angolan citizens living in the UK. The use of false documents has since been denied by both Lopes and the Miss Universe organizers and Lopes herself has stated that she had lived in England for a total of four years. In February 2013, she became engaged to former New York Giants defensive end Osi Umenyiora in Monaco. They were married on 30 May 2015. In February 2018, they announced that Lopes was pregnant with their first child together. ^ "Leila: The girl from Benguela has ascended to the throne of beauty". Jornal de Angola. 6 March 2011. Retrieved 17 March 2011. ^ Gil, Liliana (13 September 2011). "Congratulations Miss Angola! Latinas Dominate Audience Voting". Fox News Latino. Retrieved 23 September 2012. ^ a b c "Leila Lopes Bio". Miss Universe Speakers Bureau. Retrieved 23 September 2012. ^ "Miss Universe Leila Lopes Covers Maxim Portugal". Mankind Unplugged. Retrieved 23 September 2012. ^ "Beleza made in Benguela". Retrieved 6 October 2011. ^ "Rendezvous With Miss Universe and Puteri Indonesia 2011 Part 1". Retrieved 25 September 2012. ^ "Miss Universe 2011 Leila Lopes Named Ambassador of HIV Prevention For AID FOR AIDS International". Aid For AIDS International. 28 October 2011. Retrieved 23 September 2011. ^ "Miss Universe on Mission To Educate Africa & The World". Anurun Productions. Retrieved 23 September 2012. ^ a b Dupri, Alexx. "Miss Universe 2011 Accused of Fabricating Documents". Retrieved 21 September 2011. ^ "Twenty-one candidates fight today for the title of Miss Angola 2011". Angola Press Agency. 18 December 2010. Retrieved 18 December 2010. ^ "President of the Republic attends Miss Angola 2011". Angola Press Agency. 18 December 2010. Retrieved 18 December 2010. ^ Elliott, Christopher (14 September 2011). "Miss Universe 2011 pageant crowns Miss Angola, Leila Lopes". The Washington Post. Retrieved 23 September 2012. ^ "Miss Angola Leila Lopes named Miss Universe at 60th annual pageant in Brazil". Hearst Magazines UK. Retrieved 25 September 2012. ^ "Miss Universe Goes Sideways in Indonesia". Asia Sentinel. Retrieved 25 September 2012. ^ "Miss Universe 2011 in Indonesia". Retrieved 25 September 2012. ^ "Marie Noelle Ada : Miss Universe Gabon 2012". Livewireworld. Retrieved 25 September 2012. ^ "Leila Lopes Miss Universe arrived to South Africa". modenook.com. Retrieved 10 October 2017. ^ "MISS UNIVERSE, MISS USA, MISS TEEN USA SET TO TRAVEL TO GERMANY ON USO TOUR". United Service Organizations INC. Retrieved 25 September 2012. ^ "Leila Lopes Attends 65th Cannes Film Festival Party". Retrieved 25 September 2012. ^ "Leila Lopes mostra porque é a mais bela do Universo". Diário de Notícias. 30 May 2012. Retrieved 25 September 2012. ^ "Saturday Exclusive: Miss Universe 2011 Leila Lopes SOS Tour To West Africa". PR UNO Limited. 9 June 2012. Retrieved 23 September 2012. ^ "Miss Universe and Drylands Expert Tag Together, Calling for Greater Efforts to Secure Healthy Soils and Combat Desertification". UNCCD. Retrieved 23 September 2012. ^ "Miss Universo 2011 participa da Rio+20". Grupo Bandeirantes de Comunicação. 17 June 2012. Retrieved 23 September 2012. ^ "Fashion for Smiles: A Successful Event". Global Beauties. 20 October 2012. Retrieved 16 November 2012. ^ "¿Hubo fraude en Miss Universo 2011? (Short version)". Infobae.com. 14 September 2011. Retrieved 23 September 2012. ^ "Did Miss Universe use false documents to get into competition? Miss Angola's victory questioned over British student status". London: Associated Newspapers Ltd. Retrieved 16 September 2011. ^ a b "Miss Universe Accused of Faking Documents for Pageant". ABC News. Retrieved 17 September 2011. ^ "Mid Day: Miss Universe accused of faking documents". MiD Day Infomedia Ltd. Retrieved 18 September 2011. ^ "Miss Universe Organizers, Miss Angola Leila Lopes Deny False Document Claims". International Business Times. Retrieved 25 September 2012. ^ "PIX Morning News – Miss Universe 2011 Leila Lopes First Interview (9-19-11)". Retrieved 7 October 2011. ^ "Miss Angola 2011: Leila Lopes desmente descendência e acredita na inteligência para se chegar a Miss". Retrieved 25 September 2012. ^ "Miss Universe Leila Lopes Responds to Her Haters and More". Eurweb.com. Retrieved 7 October 2011. ^ "Leila Lopes: "As angolanas estão mais poderosas, determinadas e independentes" - ANGONOTÍCIAS". ANGONOTÍCIAS. Retrieved 2017-07-10. ^ "'Osi Umenyiora e Leila Umenyiora Comentam sobre as mensagens da suposta amante de OSi Fonte: Jet 7 Angola". Platina Oline. 31 May 2015. Retrieved 22 July 2015. ^ "Baby Loading… Miss Universe 2011 Leila Lopes and Husband Osi Umenyiora are Pregnant ??". Bella Naija. 28 February 2018. 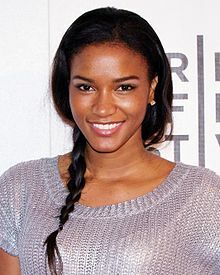 Wikimedia Commons has media related to Leila Lopes.